There is a hum of activity in 303 Bailey/Howe. One group of students has just come back from scanning documents in Special Collections, another group is adding their digitized documents to the online collection, and another group confers on the intricate details of creating metadata for each item. As they work they trade ideas about how they will build a narrative that tells a story from these historical documents. These first-year students of HST095 TAP: Digital History are creating an online exhibit. For most of them, this is their first encounter with handling actual historic documents and their first time building a digital collection. Over the past few semesters History, Anthropology and, most recently, Environmental Studies students have worked with the Center for Teaching and Learning to create digital exhibits. Working with documents from Special Collections, objects from the Fleming Museum, images harvested from the web, or using their own photographs of the physical environment around them, students have gathered, curated, studied, written about and presented the results of their work. This work is publicly available. Take the aforementioned Anthropology students: Spring 2013 semester’s Museum Anthropology course worked with the Fleming Museum to create both a physical and a virtual exhibit. “EAT: The Social Life of Food” explored “the dynamic relationship between people and food” approaching food as “a part of human life across temporal, cultural, and geographic distance through a unique and wide-range of objects. It looked at food as “something that connects humanity, and as a basic element of human life that is often overlooked.” The physical exhibit has closed but the virtual exhibit continues to provide online visitors with images of the objects in the collection. Even more importantly, it continues to showcase the voice of the students and their work. Connect with course objectives: what will the students achieve with this project and how will the work relate to the content of the course. If project work will take place during regularly scheduled class time will you need to “flip” some of your classes. http://www.uvm.edu/ctl/?Page=resources-teaching/flipped-classroom/index.php That is, will some of the knowledge acquisition that students normally experience during an in-class lecture have to be accommodated in some other way? Will you need to partner with The Fleming Museum, Special Collections, or other people or organizations? If so, what kind of lead-time do they need? Will you be using images harvested from the web? You and your students will need to aware of copyright issues. Design and develop: Think backwards. In order for students to achieve the objectives you have set, design assignments that build towards the final project with milestones along the way that keep students on track and provide them with formative feedback on their progress. For example, if the final project is an online exhibit with an accompanying narrative, have the students research and write the narrative in stages before building the exhibit. Those stages may include peer review to ensure a more cohesive exhibit. Be explicit about things like how much writing, what it should include, how to caption images and what your expectations for proper citations are. If students will be working in collaborative groups, define the roles and what each role is responsible for and plan for letting groups talk about their experiences and work to the other groups. Technical aspects: Despite the hype, students may not have all the technical skills to go from initial instructions to finished project on their own. This is where we at the CTL can help you and your students through direct instruction to your entire class and through support while the project is underway. One way of [leveraging…?] is to help students become the “experts” on various topics so that they can become the go-to expert for the rest of the group. Assessment: Students have experience with the requirements of a standard research paper but may not have a clear idea of your expectations with a digital project. How will you assess their work? A rubric [link to samples?] may help clarify and guide the expectations both you and your students have about the project. Developing assessment criteria in concert with your students’ input will also help both of you clarify those expectations. When designing the assessment measures be sure to include both content quality and product design. If the project was built by collaborative groups also assess how well the group worked together. While sitting at Dr Is In today waiting for walk-ins and trying to complete some long-overdue blog posts (yes Inés, soon…real soon now…) I decided to “attend” the Text Encoding Initiative’s annual conference, held this year in Illinois. This has always been a favorite conference and it was nice to see so many familiar faces. Well, OK, I was really just attending the Twitter back channel. Nevertheless several fascinating tidbits emerged. The network analysis work is lovely but I’m just happy to see another way of representing annotations in a fairly easy way since this is something I want to help J Bailly do with a text he and his students have been encoding. When Needs Collide, or, Hi-Tech + Low-Tech = Eureka! For years I’ve used flat-bed scanners to scan historic documents. Lately I’ve started using my iPad to photograph them instead–faster and less intrusive. Even though the results are usually reasonable I’ve often considered finding a stand to avert the inevitable wobble that results from attempting to hold the iPad flat and steady while pressing the shutter button. Trying to run the result through OCR software to turn that scanned document into text that can be edited is even harder when the scan itself is not crystal clear. Recently a request from a faculty member for quite another problem into a solution for both his and my dilemma. The request resulted from a difficulty many of us have: trying to write on a tablet device in a way that is legible so that we can record the process of that writing for a video screencast. For example, we may want to make a video if drawing a graph or solving an equation. Yes, you can write or draw on your iPad. Yes, you can attach a WAACOM or other drawing device to your laptop and write/draw on that. However, the experience is not always as comfortable as using the technology you grew up with: pen and paper. So, the request? Can one write on paper or a transparency and then capture that process using a standard classroom document camera (ELMO, etc.). The answer turns out to be yes, sort of. The doc cam needs to be a digital one, you need to find the drivers for it, and the drivers must be compatible with your computer and operating system. After some searching (and thanks to Media Services for the loaner!) I found some of the Samsung doc cams around campus could do this, with varying results. But the experience wasn’t always a happy one given the myriad combinations of doc cams and drivers (i.e. it flat out would not work with some combinations). Enter the hi-tech+low-t ech combo: a stand and a mobile device. There are stands that can hold your iPhone, iPad, MicroSoft Surface, Android or other mobile device over a piece of paper. You then use the devices camera to record writing on that paper. 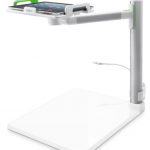 Belkin makes one (Belkin Tablet Stage Stand B2B054, $168) that can use any device as long as the camera lens close to the corner of the device. It’s being used in K-12 and up classrooms as a cheaper alternative to doc cams when the instructor has their own mobile device. The beauty of this combination is that you can use your own device, using the software that is familiar to you. 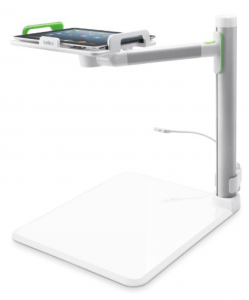 And though $168 is not inexpensive, the stand is portable and can be shared in a department. So, UVM faculty: if you write better on paper than on a tablet, want to make a video of that writing and have aniPad or other mobile device, let me know. I can loan you the stand for a week or so to see if it will fit your needs. Language learners benefit from hearing that language spoken but must often choose between hearing stilted, slow, precise examples or trying to keep up with real-life examples that happen too quickly. This is a particular challenge for students who may speak one language but must attend lectures given in another (for example, lectures given in English to listeners for whom that is a second language). The music world can help. Musicians and dancers are familiar with technology devices that let you slow down a recording without chang ing the pitch. This is a great way to play along with a recording at a slower pace, or to change the tempo of a dance to make it easier to learn. Previously these “beats per minute slow downer” devices were separate, and pricey, gadgets. Now you can get this same functionality in an app for your mobile device. Tempo SlowMo is one of them. Available for iPad and iPhone, this free app allows you to open an audio file (.mp3, m4a) and play it back at 20% to 250% it’s original tempo without changing the pitch. For spoken audio this means you can slow down or speed up the speech without turning the speaker into a bass growler or a chattering chipmunk. Is it easy to use? Yes. 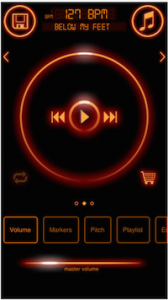 Open the audio file, play it, then use the spinner to speed up or slow down the speed. How do you get audio files into it? You can pull anything from iTunes but we all know that getting things into iTunes is not always the easiest process. Never fear. You can also pull audio files from your DropBox account. Even better, you can use a WiFi connection to connect your laptop to the app and download any audio file from your laptop. (This option uses my favorite technique: it gives you a URL to type into the browser on your laptop then makes the connection.) The app also let’s you record directly through the iPad’s microphone so you can record your own speech. Can you get audio files out of it? Yes, by sending them to DropBox or as an email attachment. ● Playlist – create, update, save and load playlists of tracks. A round-up of favorite new apps, trends, and oldies but goodies in the world of technology for instruction and scholarship. Preview – if you’ve only used it to read PDFs, check again. Look under the Tools menu for options to annotate your PDFs. Adobe – the free Reader has some annotation features, the not-free Adobe Pro has even more. Just remember that if you annotate your PDF with a video file, tell your students to read it in Adobe Reader. Preview will not be able to show the video. Screencast-o-matic – free or really cheap but full-featured screencasting tool. Limitations: records well from microhone but needs plug-in to capture system audio. Cannot import .mp4 files to edit. But for everything else it is easy, works well, and is well-documented. Camtasia – more tools, good integration with PowerPoint (Windows only), imports .mp4, records system audio, Windows version can create embedded quizzes. Explain Everything – iPad/Android app to build presentations with hand-drawing, typed text, pictures, and video, and record them as a screencast. WordPress – the UVM hosted blog. You can create multiple sub-blogs as well. Learning Analytics – What can we learn from student assessment data that can help us tailor our teaching to those students? Should we? What about privacy (FERPA)? Enter Book Crawler. It’s an iPad/iPod/iPhone app that may finally make the project of cataloging the library practical. It has a built-in scanner (using the iPad’s camera) but also offers several ways to enter data if the ISBN barcode is not available. You can type in a title, author, ISBN, LCCN or OCLC code and it will search Google Books and Worldcat to find the rest of the data. You can even add an author’s name and see a list of all their works, then select the ones you choose. It has a good range of data fields including one for whether or not you currently own the book, as well as several customizable fields. For example, I added a ‘location’ field to record whether the book was shelved at home, at work, or from one of several libraries. You can put your book in Collections that you create, then sort your library based on those Collections. You can also create and associate Tags. It is Goodreads ‘aware’ so once a book is added you can see any Goodreads reviews of the book, transfer your library to Goodreads and the reverse, and share your activity if you choose. If you care to share your activity with Facebook and Twitter there are options for that as well. You can backup your library to Dropbox, send it as an email attachment, or import and export the library as a .csv file. And how practical is it to create a library? It took 8 minutes to take the books off the shelf, scan them , and put them back. It took an additional 5 minutes to type in OCLC codes or manually enter the 6 older books that did not have ISBN bar codes to scan, then to select the ‘at work’ location field for all 54 books. Maybe this weekend will be the true test–cataloging the home library! A bit more about Goodreads: Goodreads was designed as a social media system with the main intent being sharing with others your reactions about what you are reading. You can write reviews and read others’ reviews, see what your friends who use Goodreads are reading, even see what’s being reported as read in your local community. The data that you add about each book tends towards things like tone, genre, pace, subjects, writing style, etc. Unlike Book Crawler, there is an Android version. Also, storage of your library is on Goodread’s own site which means if you are offline it will show you a list of your books but no details. Book Crawler does not need to be online to access your library or add books manually. It requires a Dropbox site if you want to make backups, although you can send your entire library as an email attachment. Neither Goodreads nor Book Crawler can automatically collect cataloging information from your Kindle, iBooks, or other ereader libraries, though Goodreads will give you access to a selection of free ebooks that you can download and store in its My eBooks area. We love Google books but, for research, often find its limitations frustrating. We love the many and varied digital collections that abound throughout the web but wish they could be used in a more seamlessly interconnected way. The vision of a national online library is as old (older?) than the web itself and in the last two years working towards that vision has been the goal of the Digital Public Library of America (DPLA), a group of people from libraries both public and academic, technology companies, government agencies, publishers and funding institutions. Launching this week* the DPLA (http://dp.la) , according to well-known digital historian and current director Dan Cohen, plans to connect “the riches of America’s libraries, archives, and museums so that the public can access all of those collections in one place; providing a platform, with an API [application programming interface] for others to build creative and transformative applications upon; and advocating strongly for a public option for reading and research in the twenty-first century. The DPLA will in no way replace the thousands of public libraries that are at the heart of so many communities across this country, but instead will extend their commitment to the public sphere, and provide them with an extraordinary digital attic and the technical infrastructure and services to deliver local cultural heritage materials everywhere in the nation and the world. *The public beta launch was scheduled for April 18, 2013 at the Boston Public Library. Given the tragic events in the area adjacent to the library, the launch has been postponed. Check the website for news of rescheduling. If you have been wondering about what the Flipped Classroom approach is and what it might mean for your teaching these resources might help. Most of these listings are annotated for easier skimming. As of now I have stopped adding general articles that describe what flipped is–there are just too many “us too” articles. However I will continue to add articles that contain some unique aspect, are discipline specific or suggest detailed activities or approaches for use in (and out) of the classroom. In addition, changing the “flipped” term in the URL above with the term hybrid, MOOC, or FHM will call up all articles on hybrid courses, MOOCs, or all three flipped/hybrid/MOOC, respectively. Given a series of online articles, which presentation format will make them easier to read: providing a list of links through which the reader must click or gathering them together as an ebook? 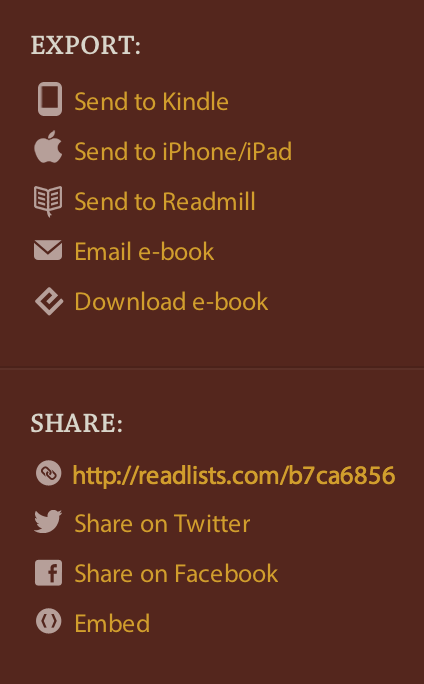 ReadLists is an online site that helps you gather together a “group of web pages—articles, recipes, course materials, anything—bundled into an e-book you can send to your Kindle, iPad, or iPhone.”Books are saved as ePub files so they can be read in iBooks or any other computer program that handles ePubs. Once created, you can sen d them to yourself or others as e-mail attachments, share them on Twitter or Facebook, or provide the link for anyone. The interface is straightforward, the process simple and the results mostly good. Some minor issues include incomplete pages (which is not too terrible–the link to the article is always included), nor can it provide PDF files in reading view although it will provide the link to the PDF so you can click and open if you are online. You can link to YouTube or other video sites but the videos are not embedded, so, as with PDFs, you will need to be online to access those. Despite these minor limitations, ReadLists does what it says and does it well–the true test of a good app.